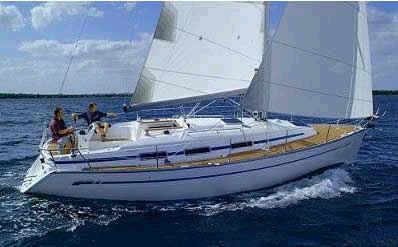 The Bavaria 31 sail handling is easy for one or more people. All lines are led aft to the cockpit, and the furling headsail and self-tailing winches make sail handling a breeze. The interior layout is perfect for 4 to 6 crew by day and comfortable sleeping in private cabins, for 4. Prices listed are for a bareboat. Skipper available at additional cost. The Bavaria 31 can comfortably accommodate 4 in private double cabins. Two single settee salon berths are available to sleep up to six. With only one head with shower, we recommend four people for an ideal charter size. The Bavaria 31 has roller reefing and furling headsail and an electric anchor winch. There is a bimini, a swimming ladder, on deck LPG BBQ,AM/FM radio & CD player, fully equipped galley with LPG stove, fridge/freezer, pre-charter cruising guides, full boat and chart briefing. Optional extras include a skipper and a provisioning service.